Yes, it looks like my senses were right about this. To be honest, it didn't need to be an expert to see this coming. So iOS and Android gaining 15%, while losing PSP only losing 2 percent. 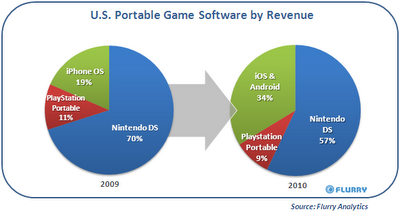 The rest of 13% was taken from the Nintendo DS market share. Interesting that Nintendo suffers most. But if you put this in relative to the size of the market share, it's save to say that in general, mobile gaming consoles will lose share over Android & Co.